The Decatur Park District is proud to announce the official name of the Nelson Park Amphitheater as “The Devon G. Buffett Amphitheater”, named in honor of the wife of Howard G. Buffett, whose foundation’s generous gift made the project possible. The venue is planned to open Memorial Day weekend, May 24-26, 2019 with show details still being confirmed. The preview of the 2019 season lineup include a variety of national touring, cover, tribute and regional acts. Musical performances will touch multiple genres and will be accompanied by comedy nights as well as community movie nights. “At the Decatur Park District, we realize that this is a quality of life improvement for not only Decatur, but much of Central Illinois. 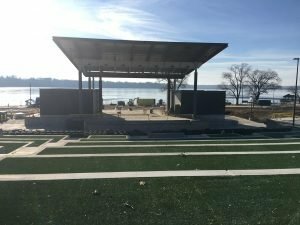 Being the only venue of its kind within a two and a half hour drive from Decatur, our goal is to make The Devon Lakeshore Amphitheater a destination for entertainment seekers from across the Midwest. Seeing it take shape has been very exciting and I feel the lineup we have scheduled so far truly offers something for anyone no matter your taste or budget. We are extremely thankful to the Howard G. Budget Foundation for its generous gift to make this a reality,” said Mike Wilcott, General Manager of The Devon G. Buffett Amphitheater. Corporate sponsorship opportunities for the 2019 season are available as well as season ticket and parking packages. For more information on the coming announcements and a full schedule of already confirmed acts can be found on The Devon Lakeshore Amphitheater Facebook page.